The end of Monkey came quickly. Or so I had thought. One minute, he was happily being chewed on. The next, vanished. It could have been anyone. After all, this stuffed monkey is desirable. I know this for a fact. Just yesterday morning, all the babies at shul were eyeing him. Two even took Monkey from my precious daughter in hopes of stealing him away. Or at least to get a turn slobbering on him. Three babies giggled when Monkey looked at them. 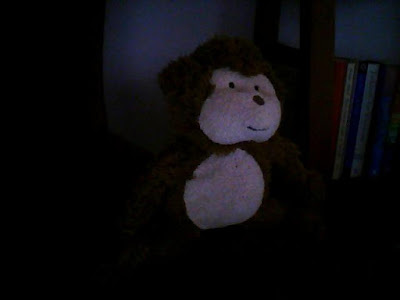 I am telling you--Monkey is a coveted stuffed animal. Still, it came as a shock yesterday evening when it was time to leave the, er..."Holiday Party" we were at and Monkey was gone. Yes, GONE! We searched everywhere--the main hall, the party room, the play room, the bathroom, the stuffed chair where I breastfed. Monkey was gone. I won't lie--I did imagine the shrink session 13 years from now--the permanent scars my daughter would suffer from Monkey's death or kidnapping or whatever! Grown, buff Taekwando-ers looked under tables for me. Tina made a heartfelt plea for help on the karaoke machine. I left our name and number with the evil twin to the instructor. Oh, okay. He isn't an evil twin. Imagine, then, my surprise...to find Monkey UNDER NEVIYAH in the car seat. Ahh, an ending with a twist! I love it! :) Yay for Monkey love! LOL You have no idea how drama filled the lost monkey was. Oy! I hate to even admit we had him the whole time!